In a food processor, combine almonds, peppers, cheese, olive oil and parsley, pulse until just combined but chunky. Set aside. Cut green beans into 2 inch pieces. 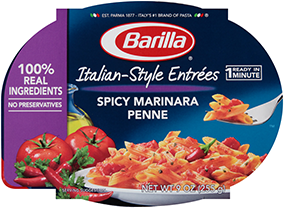 Cook pasta according to package directions; drain and reserve ½ cup cooking water. Place pasta and cooking water back in pot over medium heat. Add green beans and pesto, gently stir and heat through.